Most of the Worlds Adrift videos we've seen so far have focused on the “big” bits of the game: Magical airships blazing away at each other as they soar majestically through the sky, while players leap and swing between them and the floating islands they traverse. This new one is quite a bit calmer, and yet in many ways I think it's actually better. Play Worlds Adrift at the PC Gamer Weekender in London from March 5-6. Click here to find out more. 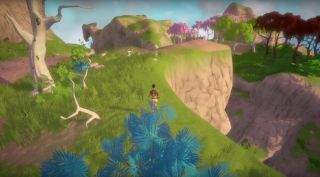 It's the opposite of epic in every way, as it follows a single character doing a bit of exploration on one of the game's islands. But it looks fantastic—not photo-realistic or hyper-detailed, just really pretty—and suggests that proper attention is being paid to an aspect of the game that I think is very important but easy to overlook amidst the sound and fury of cannon fire and collisions. After all, what's the point of exploring the floating remains of an ancient, shattered land if there's nothing to see? Worlds Adrift will be on display at the PC Gamer Weekender in London, running from March 5-6. Learn more about the game at worldsadrift.com.